Organized Crime research papers look into the highly centralized and hierarchical structures employed by criminals in order to conduct illegal activity. 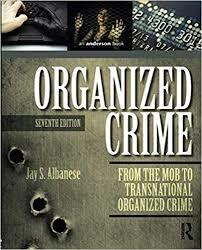 Organized Crime research papers reveal that the criminal element of "the mob" is still alive and well today. New research that has been written on organized crime by our writers tells of an evolution of organized crime from family run operations, like those found in the 1920's crime families, to highly sophisticated groups that span entire nations today. Criminal syndicates can be described in terms of several organizational structures. The Patron-client network sees smaller working units operating within a larger structure. Such groups tend to emphasize family units, entrenched traditions, and a fraternalistic value system. The Mafia as portrayed in the Godfather films or The Sopranos is representative of such patron-client networks. Bureaucratic/corporate organizations have rigid internal structures and have a division of labor within the organization. The overall goal is focused on the success of the organization and they have top-down communications structures that dictate actions. Many drug cartels are built along such lines. Internal power struggles through violence frequently jeopardize the organization. Organized Crime in the 1920s research papers examine the rise in organized crime after the 18th amendment made it illegal to manufacture, transport or sell alcohol. Order a research paper on organized crime in the 1920's from Paper Masters. Why Hollywood Glamorizes Organized Crime research papers document the values, cultural perspectives and prejudices of the Hollywood control group consistently influence movie bias. Paper Masters writes custom research papers on Organized Crime and look into the highly centralized and hierarchical structures employed by criminals in order to conduct illegal activity.